Choose your Kickers - Motorcycle Safety Institute of S.A. So many boots, so many choices, and yet so little time to choose the perfect pair. At the end of that epic ride to your office, a breakfast run, tour or race event, the first thing you do is slip those gloves off, pop the “lid”, and slide out of your riding jacket. It feels good to rid yourself of all that heavy riding gear after a long ride. What about your boots? Unless you carry a pair of slops with you, the boots usually stay on; they’re the one piece of motorcycling gear that we usually wear all day while we’re out on our bikes, and they have to protect us in the event of an accident, but still be comfortable enough to walk around wherever our day takes us. Commuters demand even more of boots. They want all the protection of a motorcycle boot, but something conservative and stylish enough to wear all day at the office. There are so many boots out there, but they are certainly far from equal. In I’ll tell you all about what makes a motorcycle boot different from a regular boot, what you should look for, and how to pick the best one for you and your riding style. Did you know that 30% of all non-fatal injuries in motorcycle accidents were to the leg and foot? 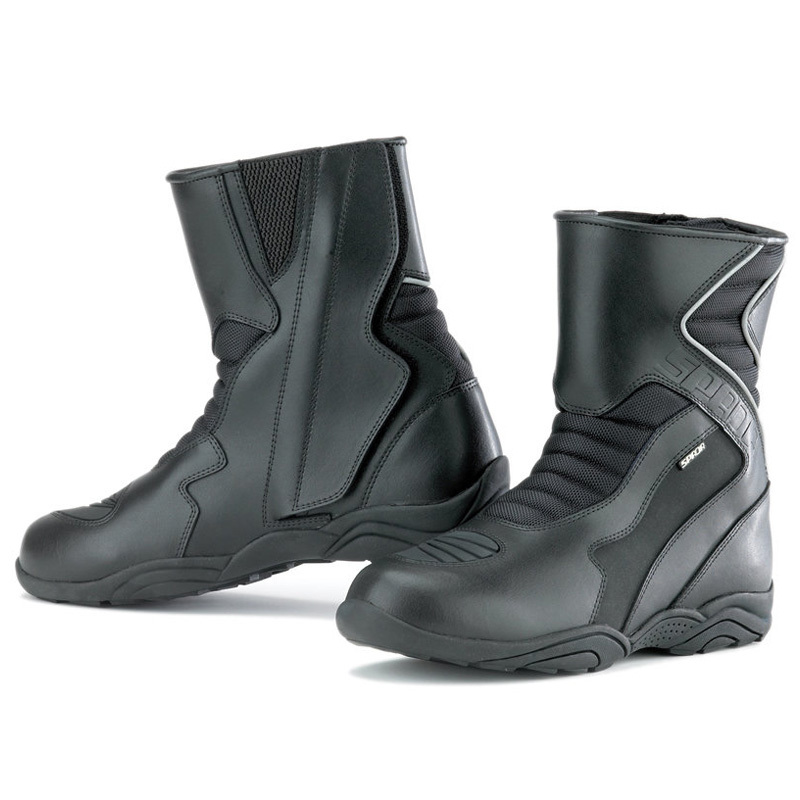 Some motorcycle boots are unmistakably different where you can clearly see their purpose for on-road or off-road use. It certainly not the same construction as you would find in a work or outdoors boot. Truth is; motorcycle boots are designed with rider-specific features in mind. Many of these you can’t see, like moulded ankle protection, increased torsional stiffness to prevent flexing, and oil-resistant soles to prevent a slip when putting a foot down. Others you may not be able to see, such as built-in shifter pads, buckles or lace-retention designs to prevent snagging, and double or triple stitching in seams that could come apart in a crash. 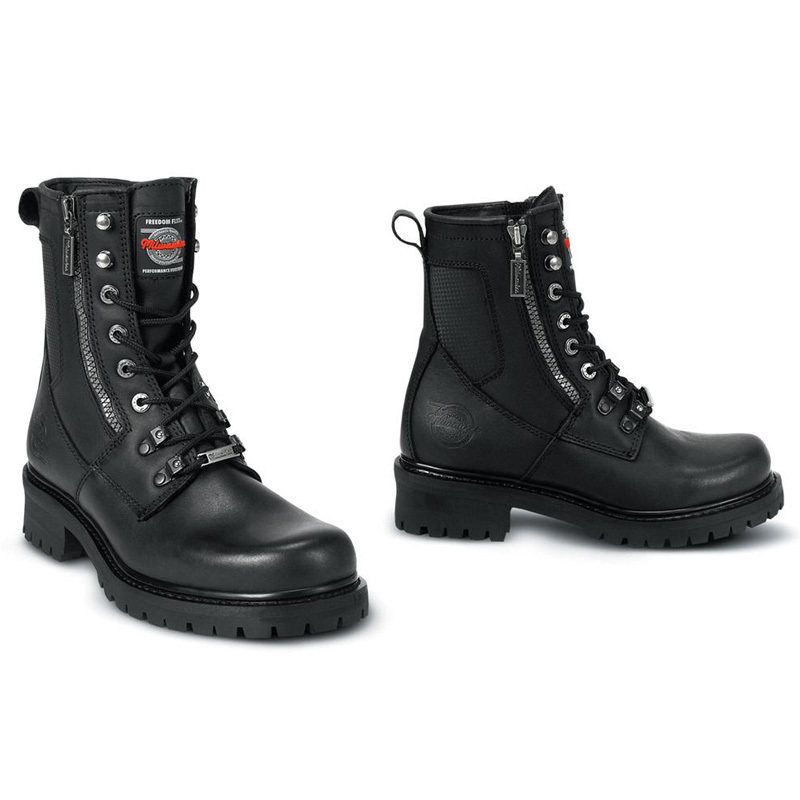 While good motorcycle boots share many characteristics with high-quality work boots; small features like these make motorcycle boots unique in design and function. It’s as true in here as it is everywhere else: “You get what you pay for.” Like a high-quality pair of work boots, good motorcycle boots have to be durable, comfortable, and protective; but unlike work boots, they need to stay together at highway speeds in order to save your skin. The engineering and materials to make this happen aren’t cheap; but they are cheaper than surgery, skin grafts, and lost time at work. Don’t dress for the ride; dress for the fall. If you are on a small budget, even the cheapest motorcycle boots are better than everyday shoes. If you get in a crash wearing a R500 pair of boots, you may not walk away without a scratch, but you will avoid a lot of damage that a typical casual or work boot may not have been able to prevent. Height: For any boot to give you adequate protection, it should come at least up over the ankle and have stable construction at the top of the boot to give you the right amount of support. 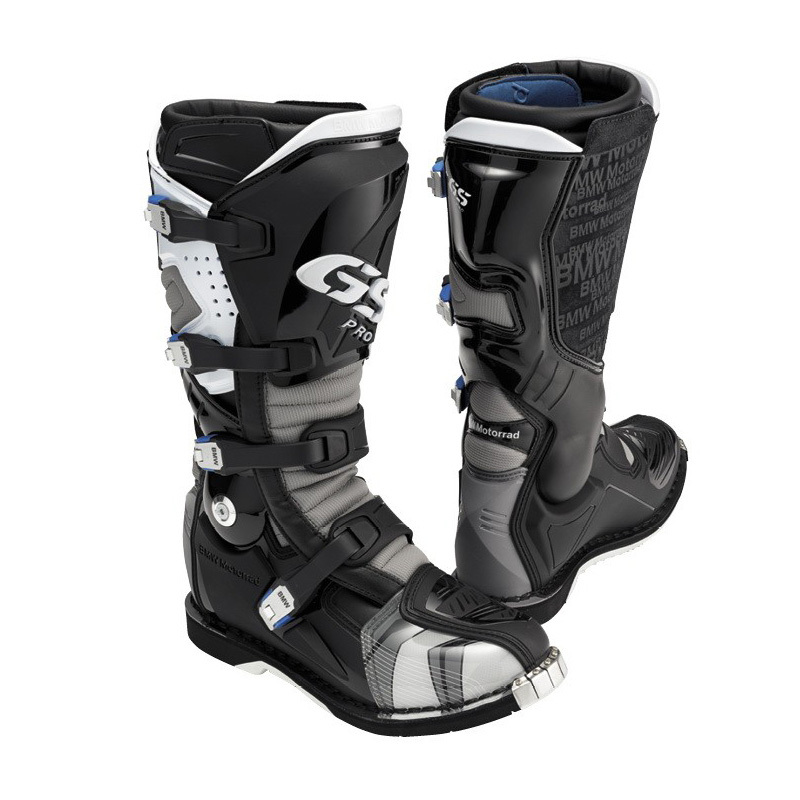 A high Enduro, Racing or Touring boot may be stiffer and less comfortable than something that only comes up to your ankle, but it does a world of difference for protection. One of the many injuries that are common during a crash happens when the foot is trapped during the fall; this motion can break, sprain and injure an ankle if it does not have enough support from your boot. In addition, because the ankle bone extends out of the leg, it can easily be scraped into the ground during a slide, even in a simple low-side crash. This is why a full height boot is best because it supports the ankle as well as keeps your foot protected. Material: Many ordinary walking shoes are made of canvas or soft leather which isn’t too significant when it comes to hitting the road. This is why most motorcycle boots are made out of much thicker leather in order to have a high abrasion resistance. Recently, however, some boot manufacturers have been producing boots with textile materials that are both abrasion resistant and more breathable. Look for reinforcements in high-wear areas, like double layers of leather, textile, or even plastic sliders. If you ride in unpredictable weather, you’ll need some weather protection, and many motorcycle boots are built with that in mind. If your boots are made of leather, make sure that it’s treated leather. Untreated leather has a tendency to absorb water rather than repel it which can make for a very uncomfortable day if they get soaked on your ride. Secure: From laces to Velcro, how your boots open and close is a fairly personal choice. Laces tend to be popular because of the ease of removing the boot and the precise fit they give; the down side is that they may come undone while riding and the hooks at the top of many laced boots can snag on part of the bike while mounting or dismounting. Some boots come with a buckle to strap or hide laces down, which is a good safety feature. 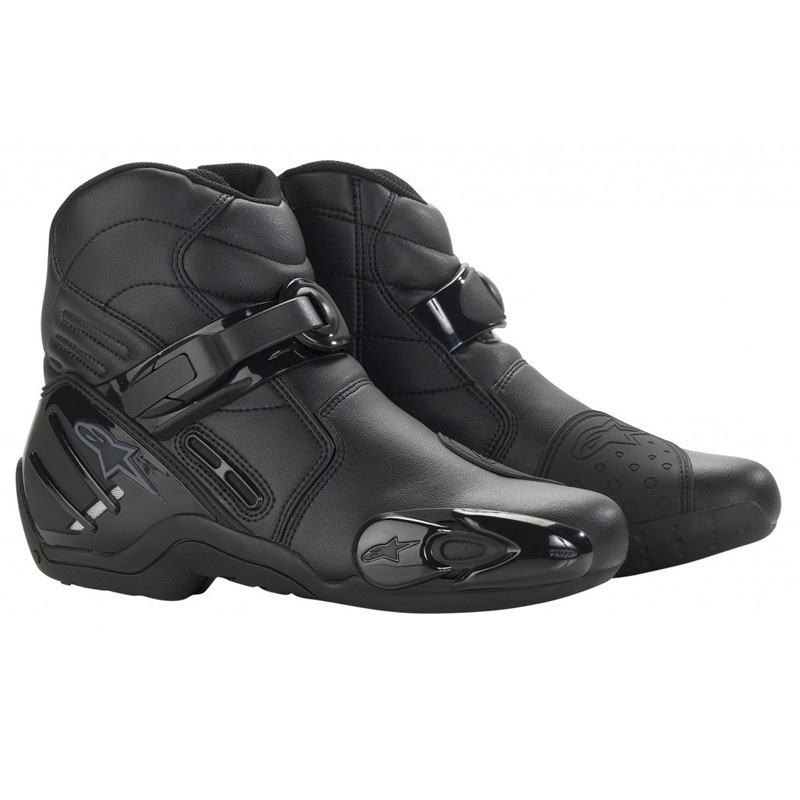 Other forms of closing mechanisms such as Velcro and buckles are also very common with motorcycle boots. These types of “mechs” often allow a rider to get a much more secure fit than laces, and are typically found on race boots to ensure that a boot will stay on in the event of a high speed crash. Construction: When shopping for boots, keep an eye on how it is constructed. The best boots will be put together with double- or triple-stitching to make sure they stay together even in a nasty accident. How the sole is connected to the boot is also a huge factor. A sole that is glued on is not as long-lasting or as strong in a crash; boots that have the soles sewn on rather than just glued on will both protect your feet more and last a longer. Soles: Depending on the type of riding that you will be doing, you’ll need a sole that gives you the right amount of grip. A softer sole will have a tendency to grip the footpeg better but will wear down a lot faster. A harder sole will have better durability but give you less grip. Either way, make sure that the soles are oil resistant, especially with street riding. Oil build up on the roads can really be a rider’s downfall (literally) if they’re not wearing boots that have oil resistant soles, especially in wet conditions. The Fit: When buying boots be sure to check the manufacturer’s sizing guide, as each manufacturer makes their boot sizes slightly differently. 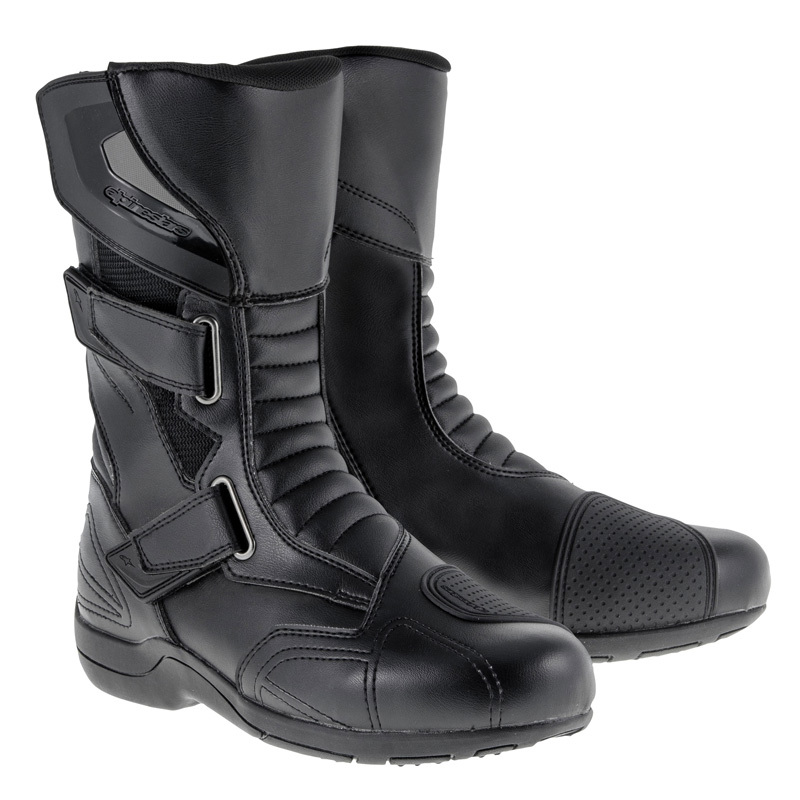 Many good motorcycle boots are from European manufacturers, so you may need to convert your US size into an EU size (many European boots also have a tendency to have a narrower fit.) Also keep in mind the socks that you’ll be wearing when you ride while trying on boots. If the boots are too tight, your feet will get tired, cramp up and could even damage your nail beds on your big toes. When you put on and take off the boots, you’ll notice that most boots will be a lot tougher to get on and off than normal shoes. It may be a pain, but if a boot is harder to get off, it’s less likely to fly off in a crash and leave your foot exposed in its time of need. Eventually you’ll get used to it, and fitting them or taking them off won’t be such a pain anymore. 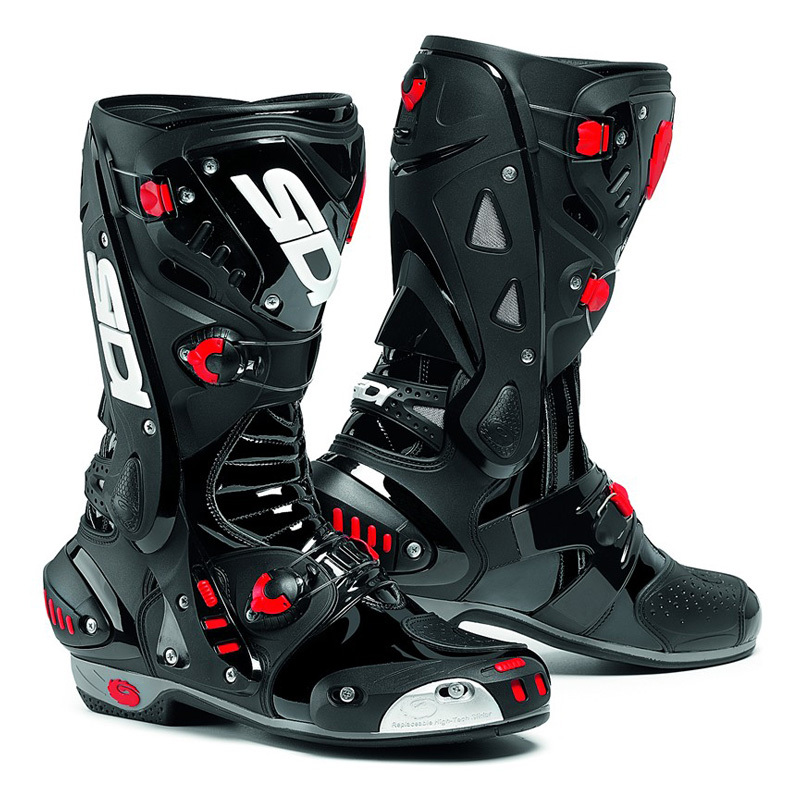 Protection: Extra armour and padding is always a plus when it comes to protection, especially with racing boots. Many racing or sport boots will come with built in armour made out of Kevlar, carbon or plastic that is placed in high impact and fragile areas. With street or cruiser boots, it’s common to find some that come with steel plates around the toe area to keep your toes from getting crushed. Steel plated toes have been proven to protect feet and may be considered. Replaceable Parts: When it comes to boot maintenance, some boots, like track boots, come with a fitted bootie that not only allows for a racer to get the best fit possible, it can also be taken out to be cleaned or aired out. Another huge perk is to get a pair of racing boots that has removable and replaceable parts such as toe-sliders that can get chewed up quickly. This will allow you to just change worn down parts rather than buy a whole new pair of boots. They fit you, but do they fit your Bike? After you’ve found a good pair of stompers that fit your foot and your style, make sure that it also fits your bike. You don’t want to invest in a pair of boots only to find out that the shifter pad is too thick and it won’t slide in between the footpeg and the gear shifter. Plus a heel that is too big will just get in the way and make it harder for you to move your foot where it needs to be quickly. Footwear may seem like such a simple buy, but there really is a lot that goes into a good pair of motorcycle boots. Take your time in shooting through your options and don’t be afraid to drop a little extra money for the good stuff. If ever you actually need all that extra protection good motorcycle boots offer, you’ll be glad you spent the tom. Before you buy a particular pair of boots, make sure they feel right when you’re on your motorcycle or sitting on a bike that simulates your normal riding position. Pull on the boots, sit on your bike and grab the controls. Can you feel and work the foot controls with ease? Are the boots comfortable in this position? Do the boots pinch your feet or chafe your legs? If you’re still satisfied with how they feel and perform, then they’re the motorcycle riding boots for you. Now buy them with confidence, pull them on and go for a ride!